Once upon a time I drove from sea to shining sea with a toddler in the backseat. It was freedom, the bliss of the open road à la Kerouac, minus the drugs and polyamory. You’ll have to forgive me if I now get misty eyed over that monumental journey, since it took place over a decade ago. And I’ll admit that perhaps my memory is also a bit clouded. In fact, “freedom” may not be the best adjective to associate with that trip since my husband Matt and I felt like we couldn’t drive much more than six hours in a day without stopping for our one-year-old’s early bedtime. Certainly we weren’t unencumbered; our small sedan was so full of gear that we risked decapitation by flying board books should we stop suddenly. But what we did share is a feeling common to every road trip I’ve ever been on: a sense of possibility, a thrill at the thought of unexplored places waiting to be found, a feeling of contentment that comes when the people you love best in the world surround you in a small place (at least until they start getting on your last nerve). Somehow I always seem to forget that last part. 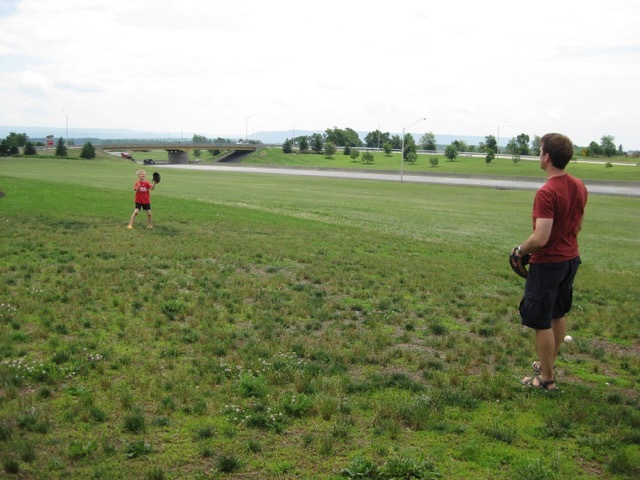 I’ve written before about how Matt and I embarked on a 13-month adventure with Tommy right after he turned one, but the fact is that when we did so we were already old pros at the family road trip game. That’s because around the time Tommy was three months old in 2002 we cooked up a simple plan in our sleep-deprived bliss: We would drive from Delaware to Kansas City to visit my best friend. But we couldn’t drive all the way out there without stopping to see Matt’s family in Wisconsin on the way back and if we stopped to see them, we had to make sure we passed through Vermont where my father and stepmother lived. And before you could say family travel we were on a 3-week, 4000-mile trek through 15 states and Canada. Did Tommy roll over for the first time on a questionably clean and undeniably shabby bedspread in a seedy hotel? Did I nurse him in gas station bathrooms repeatedly? Did he cry in every single restaurant, starting just as the food arrived? I plead the fifth. We recreated a good portion of that trip in 2009, this time with two children who were both old enough to complain using their words. 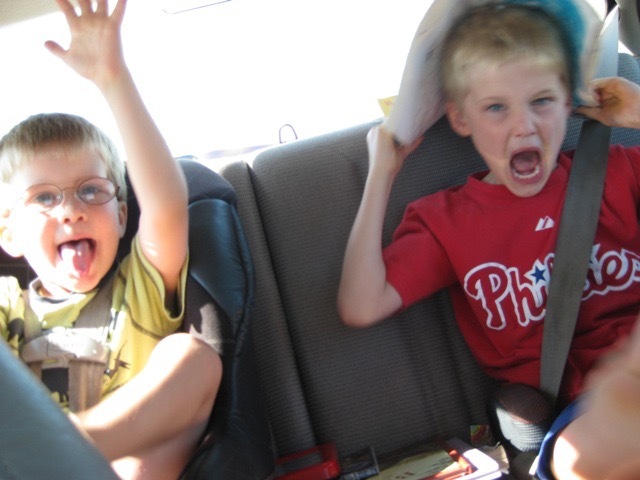 That summer I tallied up that we spent about 49 hours in the car over 18 days. Our younger son Teddy may have only been four years old, but he gamely enjoyed our various discoveries, which included an Ohio delicacy called sauerkraut balls. And since the boys started downhill skiing a year or two later, my family began routinely spending up to nine hours in the car to reach the Green Mountains. We’ve become the family that leaves after school, soldiers through rush hour traffic, eats sandwiches in the car, and almost gets stuck at the top of a twisting mountain road at midnight, all for just a few days on the slopes before we head home again. We’ve driven the entire length of the New Jersey Turnpike so many times that I know where the mile markers are. The happy result is that my kids consider any car trip that’s under four hours to be short. 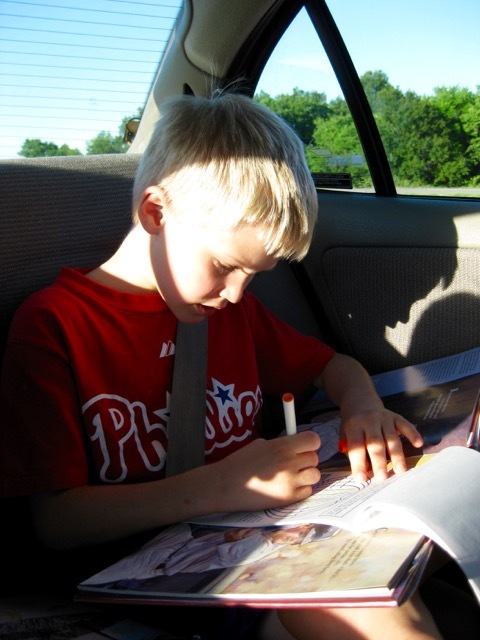 So if I’ve mastered the family road trip, what story is there left to tell? I’m the expert right? Why not coronate myself Queen of the Open Road and move on? You see, I’ve never been one to rest on my laurels or to do things exactly the same way twice. That’s why I’ve decided that the next frontier for me is another long road trip. Only this time I won’t have a co-pilot. That’s right: Just me, the open road, and an 11- and 14-year-old. The nice thing about the road trip I have planned for June and July of 2016 is that it will be broken up in the middle by a multi-generation vacation in Wisconsin with Matt’s family. He will be flying out to rendezvous with us, his sister and her husband, and his parents for a relaxing week of playing cards, eating junk food and spending as little time as possible in the car. But here’s the rest of the plan: starting in Delaware, the boys and I will head to Capon Springs, West Virginia for several days, where we will relax at an old-fashioned family resort complete with porches, bonfires, and a spa. Pittsburgh is next – there’s a lot we want to do there, including a stop at the Andy Warhol Museum, the Nationality Rooms at the University of Pittsburgh, and the Conflict Kitchen, a restaurant serving foods of countries with which the United States is in conflict (Tommy is a foodie and a history buff, so this will push all his buttons). Sandusky, Ohio is our last stop before heading to Wisconsin. Will any of us want to ride they myriad roller coasters at Cedar Point? That remains to be seen. I’m a bit less certain about the exact stops on our return journey, although I know that we will be spending a night at Niagara Falls before winding our way back home via the Finger Lakes region – an area of New York State that I’ve never before visited and am excited to check out with the boys. According to Google Maps, the itinerary I’ve planned will cover 2131 miles and include 34 hours of driving, all of which will of course be done by me since I’ll be the only person with a license in attendance. We’ll get to eyeball no fewer than three of five Great Lakes and will spend time in two countries. I’m super excited about this adventure and am already thinking about all the ways I want to engage the boys with what we’re doing. We’ll be making at least one surprise stop to geocache, which is a favorite activity of theirs, in West Virginia. Once I’ve got the itinerary locked down, I’m going to look for local attractions like farmer’s markets or maybe the Hot Dog Bun Museum where we can stop and stretch our legs. Will there be bickering over music, too much screen time, boring stretches of flat, featureless highway? Of course. But there will also be the chance to revisit the Harry Potter books (something I’ve been meaning to do for a long time), lots of new destinations to explore, and plenty of time just to be together and breathe together and talk about anything and everything. Meanwhile, I’m trying to figure out a great hashtag to use while I’m sharing blogging postcards and social media posts from the road. 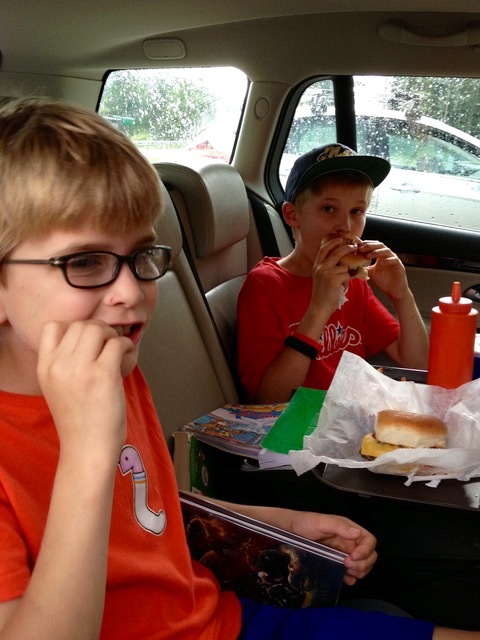 I had chosen #1mom2tweens but the boys absolutely hate it. Apparently the word “tween” is not cool. And in fairness, Tommy is 14 so it’s not even totally accurate. #DEtoWItoDE seems obscure and #MidAtlantictoMidWest is cumbersome. If you’ve got an idea or opinion I’d love to hear it in the comments – I’ll even send a signed copy of my book to anyone who comes up with a hashtag I can use. Have you got any summer road trips planned? Let me know if the comments or on Facebook. 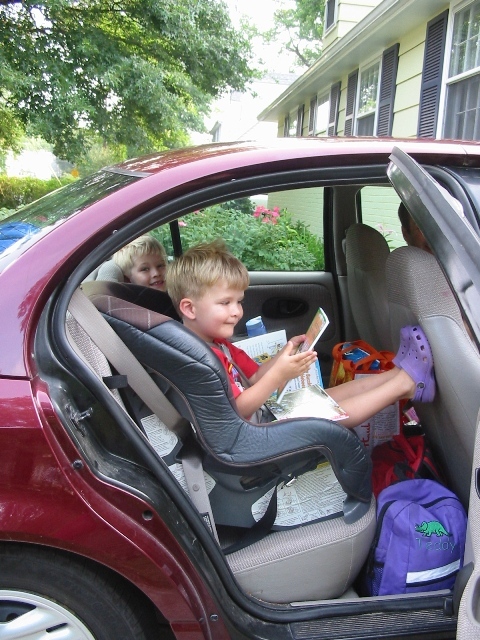 Looking for more family road trip tips? Check out these posts. #MotherofallRoadtrips ? Good luck, it sounds fun! 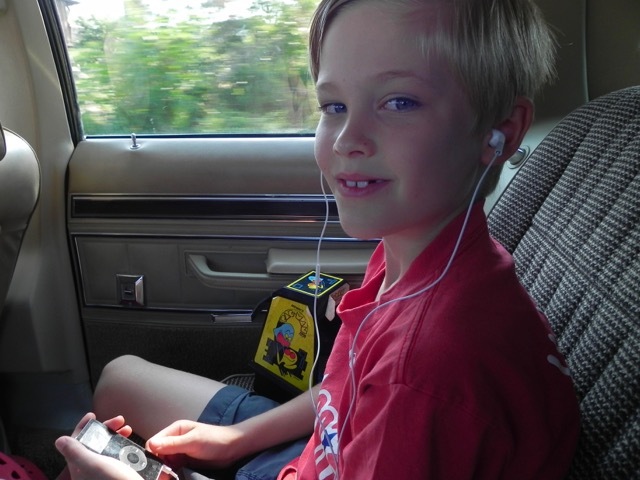 I do a few long solo road trips each year with my tween and it can get tiring to always be on but I just love it. We will be in the Finger Lake region in early August so maybe we will cross paths. We will also be in Delaware in a couple of weeks..but Southern Delaware. THis looks so fun! I’m also headed to West Virginia later this summer, so I particularly look forward to your dispatches from there. I Love This Lovely Road Trip. Thank you Mara, For sharing this story.